Well organised movement preserves energy and improves our vitality. But the opposite is true too. Tiredness, a loss of energy and fatigue are often related to the way we move and use ourselves in everyday activities. Moshe Feldenkrais observed that it is not so much what we do but how we are doing it that makes the difference in how we feel. 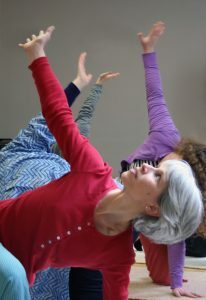 Using techniques developed by him, we learn how to coordinate movements better, ensure we breathe easily as we move and use only the appropriate amount of muscular effort for the task in hand, in order to enhance our energy levels, our vitality and the way we feel in our bodies. We explore movements in different positions, mostly lying on the floor, and follow our sensations of comfort and ease. Floor mats or rugs are required (can be provided by leader). ☐ When : Thursday, 11.15 a.m. – 12.15 p.m.